Therapeutic water massage, a unique hydro-combing action that stimulates the skin. 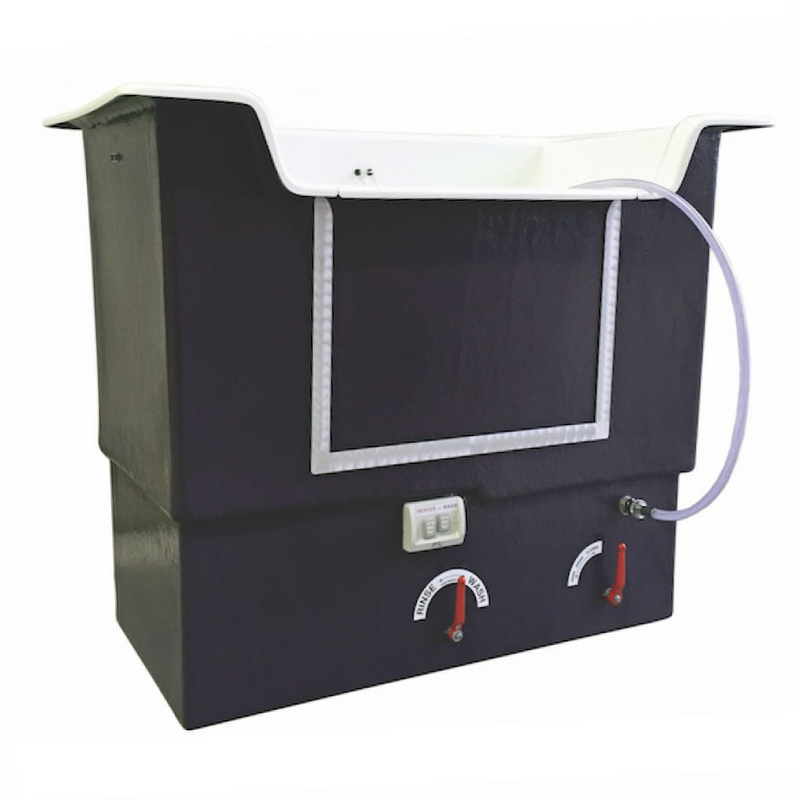 A Hydrobath is a complete unit combination bathtub and power bather that uses a specially designed recirculation pump. This pump produces a high volume mix of water and shampoo delivered powerfully enough to penetrate the thickest coats, yet gently enough to massage the skin. All in the fraction of the time taken by normal bathing methods. The high strength fibreglass hydrobath tub is suitable for all sizes and breeds from Maltese Terriers to Great Danes and there is no mess to clean up after bath time or Dogs running away from the hose or bucket – the Hydrobath keeps both Dog and water suitably contained. How does a Hydrobath work? fully penetrate the dog’s coat and onto the skin where most problems occur. The water returns to the collection tank (sump) at the bottom of the bath, it is then filtered and pumped back through the shower head to ensure that your dog’s coat and skin are completely cleaned. When the dog is thoroughly cleaned, fresh warm and clean water is released into the sump to rinse your dog completely before adding conditioner where it is needed. What are the benefits of using a Hydrobath? The spray head produces a unique hydro-combing action that massages and stimulates the skin, so not only is it the most effective way of washing your Dog but also provides a therapeutic water massage. This helps with blood circulation, relieves tired muscles and has been found to be beneficial for Arthritis sufferers and older Dogs. Water penetrates the coat getting right to the skin removing dry dead skin cells, embedded flea eggs and other materials that can be hidden and hard to get rid of, especially for Dogs with longer and thicker coats. Another excellent advantage is that certain treatment solutions for skin conditions or flea prevention can be added to the water during the Hydrobath. This ensures that maximum benefit is obtained from any treatment as the water spray not only gets deeply into the fur but also reaches the skin, which is most important for any type of treatment.